Some people go to the emergency room following a car accident because of pain or just to be on the safe side. It is standard for any doctor checking you whether in a clinic or hospital to perform range of motion checks, orthopedic checks in which they attempt to reproduce any pain you are having to trace the source of that pain, and neurologic checks to rule out problems such as tingling or weakness from nerves and to verify all of your reflexes are intact. In the case that such nerve problems exist or you are in so much pain that you cannot perform any of the tests, x-rays of the neck, back, or area of bodily impact are performed. After being cleared of any major complications such as symptoms of an unstable cervical spine, a medical doctor will usually release you with a prescription for pain medication and muscle releaxants. Besides this, ice should be used on the area of injury to reduce swelling. The major swelling will occur between 12-72 hours. If you just had an accident, you may feel worse for the next few days than you did right after the accident happened. When icing, apply it for 20 minutes every 2 hours that you are awake. If pain wakes you up at night, you can certainly apply ice at that time as well. Heat should not be applied to a newly injured neck or back for the first several days. Though the heat feels good at first and may have helped reduce tension after a long day in the past, it has a very negative effect on newly injured tissue. It dilates the blood vessels going to injured muscles, ligaments, and tendons allowing MORE swelling to come into the area. Ice prevents more swelling and has a pain killing effect. Early passive range of motion (where a therapist is moving your body for you and you are not exerting muscle effort to move) is very helpful in allowing quicker recovery. After about 3 days or when swelling has reduced significantly, it is then time to do active motions. For example in the neck, you want to turn your head as far left and right as you can go without pain. Then tilting left and right. Then bending forward and backward. Avoid resisted exercise or heavy duty workouts initially. Most MD's will tell you to come back if it still hurts after a week or two and to just take the medicine and let it go away. 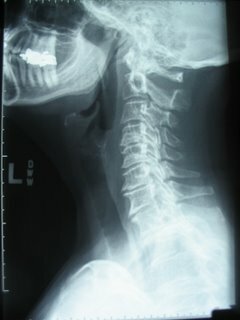 As a chiropractor, I often see x-rays of a 30 year old neck which look totally healthy except for arthritis in one particular joint. After asking the patient, we often find out that they were in a car accident many years ago and were never evaluated or treated for it since the pain went away 2 weeks later. Just because the pain goes away doesn't mean that it healed properly. To allow proper joint and muscle healing, time is of the essence. The repair of damaged tissue happens in the 4th - 6th weeks. Massage helps to keep the muscles from being in constant spasm during this time, physical therapy helps by helping a patient gain better range of motion and reducing swelling with the use of modalities (machines) and educating patients on when they can do certain activities, and chiropractors perform careful adjustments to allow proper lines of healing in joint tissues and muscles so that they heal stronger minimizing future flare ups. In a study published in the "Journal of Orthopedic Medicine" chiropractic was found to be the treatment of choice for whiplash. Most chiropractors utilize massage and physiotherapy techniques in the treatment of whiplash. If you go to a chiropractor who focuses solely on the adjustment portion of the treatment only and does not do any of the other necessary treatments, you should also see a physical therapist and possibly massage therapist in addition to the chiropractor, or just transfer to a chiropractor who does all parts of the protocol for proper healing based on research. There are many natural supplements which help with pain and swelling, but the most promising which is gaining more and more research in the past 10 or so years is Omega III Fatty acids. This is also sold over the counter as EPA/DHA or Fish Oil. The oils in this are key in reducing pain and actually increasing your threshold to handle pain. It also acts as a natural anti-inflammatory (if you don't like taking a lot of Ibuprofen (Advil, Motrin, etc..) Other researchers are studying Omega III for its ability to lower bad cholesterol. In fact, it's so powerful that there are some warnings that one should ask their doctor about taking it if they're already on a prescription cholesterol reducing drug like Lipitor. Omega III contains EPA and DHA and are usually in a 3/2 ratio. I recommend my patients take it 4 times per day during the entire swelling and repair stage of healing following any injury. It's available at health food stores and in the vitamin section of any drugstore. There's no need for Omega 6 which is sometimes packaged with the Omega III. Omega 6, though needed in our diet is in excess in the average American diet and has the opposite effect on the pain threshold and inflammation.